Home | Llangynog Tourist Information and pictures of Llangynog, Powys, Wales. It also has easy access to the town of Llanfyllin, and lies just 20 minutes from one of the Seven Wonders of Wales, the Pistyll Rhaeadr, or the Rhaeadr Falls. Bear in mind distances are as the crow flies and that the journey might be considerably longer ..but then that is all part of the fun of walking. If you enjoy walking, then Llangynog is the place for you. There are plenty of beautiful walks around both the village and the surrounding area, offering incredible, panoramic views. Just 2 miles from Llangynog is the village of Pennant Melangell, home to St Melangell's Church. It is a beautiful and tranquil place in a rural situation at the end of a valley. Since its restoration in 1992 the remarkable mediæval church, with its shrine containing the bones of the seventh century St Melangell, has attracted visitors and pilgrims from all over the world. It is one of the loveliest small churches in Britain, and one of the most remote. 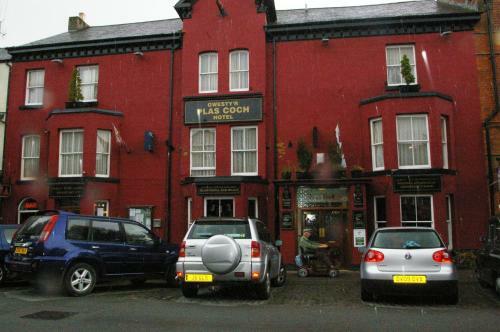 Llangynog itself has two public houses, pubs, parking, and a public telephone. Away from the walks, a Flower Show is held in the village every August, enticing hundreds of visits each year, and there are also Sheep Dog Trials held every September, always a fun event. You may make an instant secure hotel or cottage reservation close to Llangynog. Hotel and cottage availability and letting rates are confirmed online prior to booking. Simply click through to the accommodation page, choose a suitable property, check availability, including dates of stay, to confirm the exact room rate and reserve the accommodation.